You are here: Home / Adam in the Media / Official-Unofficial Readers – Submit Questions for Adam Lambert on AT&T’s Google+ Hangout!!! Adam Lambert will be on Saturday’s Google+ Hangout panel answering fan questions. And we want you to tweet us or comment below with your questions! Adam has generously given his time Saturday, June 14, 2014 at 1 PM Pacific to answer questions from his fans, via AT&T’s Google+ Hangout. This is all part of his involvement for the second year in a row in AT&T’s LiveProud campaign for the LGBT Community. The LiveProud campaign is centered on awareness, empowerment and most importantly pride. The Hangout will be LIVE and we all know the excitement Adam brings to every live performance, whether singing, acting and especially answering questions! He’s honest, spontaneous and most of all, humorous. You can view the live chat by signing up for a Google+ account and following Adam on the Adam Lambert Google+ page. Go to that page Saturday at 1 PM to watch all the action. We encourage you to take an active role in the Hangout. 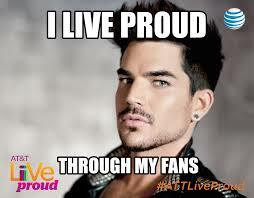 Submit your questions by tweeting them to @adamlambertidol using the hashtag #ATTLiveProud. Putting them in our comment section won’t work. You must tweet with that hashtag. But please, be creative! Give Adam something new to think about or chuckle over. We’ve seen too many interviews where the same old questions are asked over and over and over. Let’s make this Hangout different! UPDATE – In case you missed the interview, here it is! Saturday. One week from tomorrow I’ll be in Chicago for the Queen and Adam concert. As time has passed since Adam’s Idol Days; I have come to realize just how extraordinary he is in so many more ways than just his musical abilities. Thanks for all you are Adam! Seeing Queen perform is on my BucketList & to see Adam perform with them is beyond anything I could ever have imagined! Will be at Chicago & Detroit Concerts! Looking forward to Saturdays Hangout! I have been a fan since day one. I am the leader of the Florida Glambs, a group formed through this site. I would like to ask Adam a question related to his mom, Leila who is obviously a very proud mom. Will she be busy working on the design and furnishing of his new home and is she still running his fan club? Does she travel to many of his shows? I wish I could see a Queen and Adam show but I am not amongst the blessed. Health and finances will not allow it. He is a gorgeous, talented amazing human being. I wish he would find a nice new b f. He’s been alone since he and Saudi broke it off.